Joseph Watson of Massachusetts opened an office in Boston in 1858 as the agent for the Lowe Press, and in 1861 launched Adams’ Adams Cottage Press in New York. 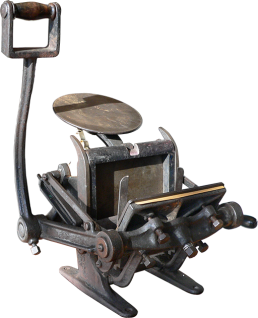 In 1871 Watson patented the Young America, a sturdy press offered in chase sizes from 3 x 4 1/2″ to 10×15″. The press evolved from a hand-inking model with combination hand and foot lever (1872), to a hand- or foot-lever press with self-inking attachment (from 1873), to a true self-inking press (from 1881). By 1886 the hand-inking series had been discontined. Watson manufactured the Young America until 1896, when his business was absorbed by rival William Kelsey (see Kelsey’s Excelsior 3×5), who also took over the businesses of B.O. Woods (maker of the Novelty), J. Cook and Company, and Curtis and Mitchell (Caxton).